Arrive At Delhi Airport/Railway station and transferred to hotel. Check in the hotel and relax for some time. Rest of the day is at leisure for your individual activities. Overnight stay at the hotel. After Breakfast check out the hotel and transferred to Delhi Airport to board a flight to Varanasi. On arrival check in the hotel and relax for some time. In afternoon proceed to Sarnath, an important Buddhist site, a deer park where Lord Buddha gave his first sermon. Later back to the hotel. In evening attend the evening Aarti on the banks of river Ganga. Later back to the hotel. Overnight stay at the hotel. Early in the morning enjoy the boat ride in the river Ganga. Later back to the hotel. After Breakfast proceed to half day sightseeing of temples and Ghats that will include Kashi Vishwanath Temple, Darbhanga Ghat, Durga temple, Panchganga Ghat and many other attraction. Later back to the hotel. Evening is at leisure for your individual activities. Overnight stay at the hotel. After Breakfast check out the hotel and proceed to Varanasi Airport to board a flight to Khajuraho. On arrival check in the hotel and relax for some time. Later visit the Khajuraho group of temples. These Hindu and Jain temples, erected during the medieval times in the reign of Chandela rulers. Overnight stay at the hotel. After Breakfast check out the hotel and proceed to Orchha. On arrival check in the hotel and relax for some time. In afternoon proceed to half day sightseeing of Chhatri, Havelis, Raja Mahal, Laxmi Narayan Temple and other attraction. After sightseeing back to the hotel. Overnight stay at the hotel. After Breakfast check out the hotel and proceed to Gwalior by road. On arrival check in the hotel and relax for some time. 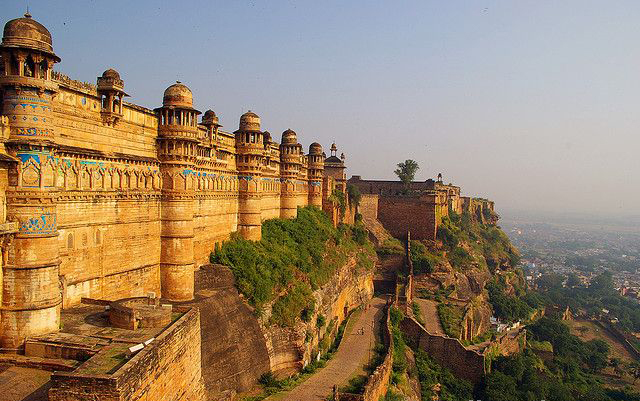 In afternoon proceed to half day sightseeing of Gwalior Fort, Saas Bahu temple and Suraj Kund. After sightseeing back to the hotel. Evening is at leisure for your individual activities. Overnight stay at the hotel. After Breakfast check out the hotel and proceed to Agra. On arrival check in the hotel and relax for some time. Rest of the day is at leisure for your individual activities and you can also explore the popular markets of Agra where you can shop for handicrafts, special embroidered dress material. Later back to the hotel. Overnight stay at the hotel. Early in the morning visit Taj Mahal – one of the Seven Wonders of the World to view the sunrise. After Breakfast at hotel visit the magnificent Agra Fort also known as the Red Fort. Later back to the hotel. In afternoon check out the hotel and proceed to Delhi Airport/Railway station to board a flight or train for your onwards journey. If you have not decided yet or wants to customize tour itinerary or hotels listed above in "Central India Temples With Taj Package By Indian Holidays", then we can change the travel itinerary and make a personalized, tailor-made holiday package, especially for you. We can modify this travel package as per your itinerary, budget, duration and the tourist places you would like to visit, including transportation and airfare should be included or not. Please fill the form below to contact us.